Portland IWW 20th Anniversary Party! For the last 20 years the Portland IWW has been a consistent and innovative organization at the forefront of militant labor organizing in our region. Hundreds of people have been involved in our union throughout this time, many are still active today, and others are just getting started. It’s time to celebrate this legacy, in a time when unions are needed more than ever. This event will be an opportunity to meet up with old comrades, and learn more about what the IWW is up to today. Our friends at Cider Riot!, Portland’s newest cider bar, will be hosting us in the cidery. 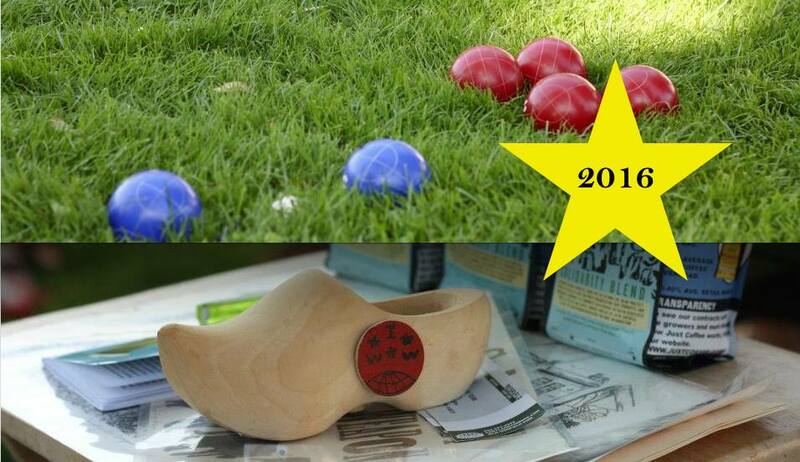 There’ll be plenty of opportunities to mingle, share stories, and view a slideshow of years past. The event is all-ages, and open to all friends, family, and fellow workers from near and far. Our Junior Wobblies coordinators will be on hand to provide kids activities on site! There is a suggested donation of $5-$10 to help fundraise for the Union Benefits program of the Burgerville Workers Union, an IWW organizing campaign. There’ll be pizza on hand too, courtesy of Scottie’s Pizza. Be sure to RSVP with this link to secure your slice! Solidarity with PSU graduate student workers! 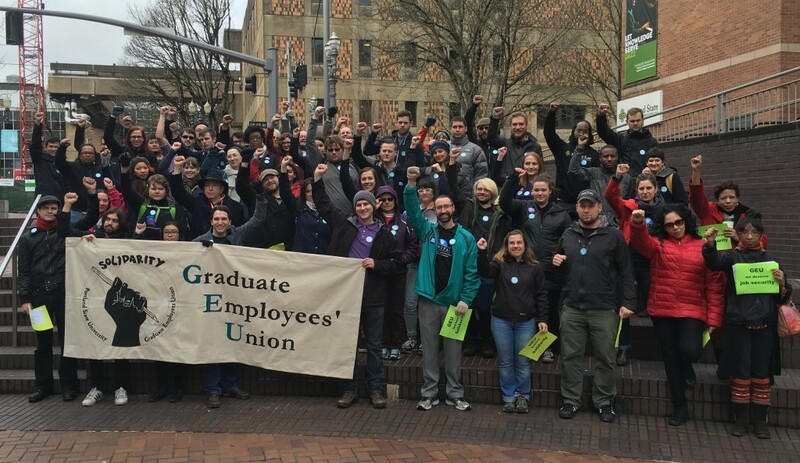 There’s a new union campaign in town at Portland State University. On Monday, Feb. 1, there was a lively march to the university administration building, where workers presented a demand letter to the university president. After reading out testimony and a list of demands, workers informed the president that they expect his signature on their letter of agreement by February 15. The president tried to engage workers in a dialogue, but everyone held their ground saying there was nothing to talk about until after the university recognizes and begins bargaining with the union. Chanting, “We’ll be back!”, the workers left the building in unison. Be sure to stay tuned for more actions and rallies to support these workers! 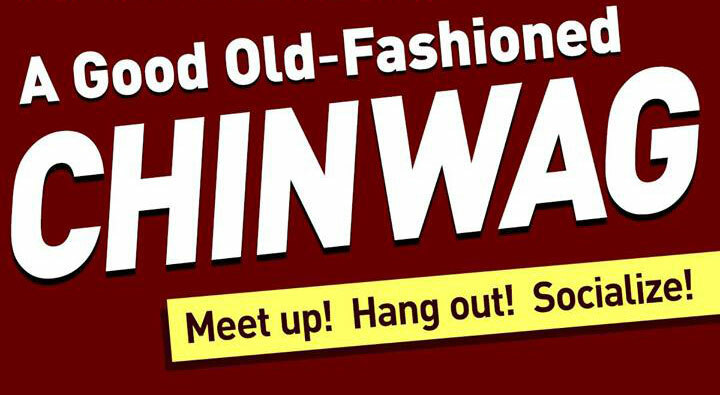 The next Portland IWW social event – the Chinwag – will be on TUESDAY, MARCH 31 at the Lucky Lab Brew Pub on SE Hawthorne Ave. The meetup will be from 6:00 – 10:00pm, with children welcome at the Lucky Lab until 9:00pm. Come and hang out with members of the Portland branch of the Industrial Workers of the World! A Good Old-Fashioned I.W.W. Chinwag! Please join us for the first good old-fashioned I.W.W. Chinwag of 2015! This is simply an excuse to meet up, hang out and have a good time with your comrades! And this is NOT a private I.W.W. function. Quite the contrary! This is open to all, so tell your friends, drop by and join in the fun! Children are permitted at the Lucky Lab Brew Pub until 9:00pm! Walmart Black Friday Rally PRE-GAME with the I.W.W. Join the Wob Squad as we meet up at the Portland IWW office on Friday, Nov. 28 before the official Black Friday Rally at the Walmart on SE 82nd Ave in Portland! Please SHARE, bring anyone else who might be interested in attending, something light to eat and share, and be ready for an exciting morning of direct action! Seven workers and union activists head toward the office on September 17, just before the morning shift begins, debating how to enter. Should they all parade in together? What if lower management is out front smoking before the shift begins? Should they go in early, or wait until the day’s canvassers are already inside? They agree to head in together in a show of solidarity, a few minutes before the bell rings. As the workers file in the front door, their union representatives in tow, management declares that outside people are not allowed to enter during business hours. “Don’t worry, we won’t be long,” says Jonathan Steiner, a rep for the United Campaign Workers, a project of the Industrial Workers of the World Workers. The workers and their union representatives enter and declare there is announcement to be made: They have joined a union and are inviting other workers to join them. Street Canvassing for Good Causes: The Worst Job in Town? Outside of coffee shops and bookstores, crowded Whole Foods stores and worker-run co-ops nationwide, you‘re bound to find canvassers asking for donations or signatures in support of a host of causes. They’re often young people shaking the can for high-profile nonprofits. But as we get deeper into the post-crash precarious economy, the image of canvassers as idealistic college students making a few extra bucks on summer break quickly disintegrates. People are turning to this occupation as their primary source of income, according to many active campaigners. They are hired by independently contracted companies to canvas for nonprofits. The quotas are demanding, making the work one of the most difficult low-wage jobs to hold on to. In Portland, Oregon, one union local as formed precisely to take on this precarious world of street canvassing, and they are growing at a pace no one could have predicted. WORKED Discussion Nights are a space for workers* to learn, share and act. Come share struggles and successes, learn from peers and allies, and strategize ways to take action on our dreams of fair and democratic workplaces. RSVP here to let us know that you can make it to any of the WORKED Discussion Nights. *Work doesn’t always get a paycheck! Students, interns, and volunteer and unemployed workers are encouraged to join the conversation. To build a space for all workers, we ask that employers and supervisors with hiring/firing power not attend. Please be prepared to be respectful, supportive, maintain confidentiality and promote a safer space. May Day 2014 in PDX! On Thursday, May 1, we invite you to march with the I.W.W. during the May Day celebration in downtown Portland! ALL WORKERS are welcome to join us! Our strength lies in our numbers, and working class solidarity is our goal and the tool with which we will create a better society within the shell of the old. We’ll see YOU on May Day, at Park Ave. & SW Main St. in downtown Portland, at 3:00pm!